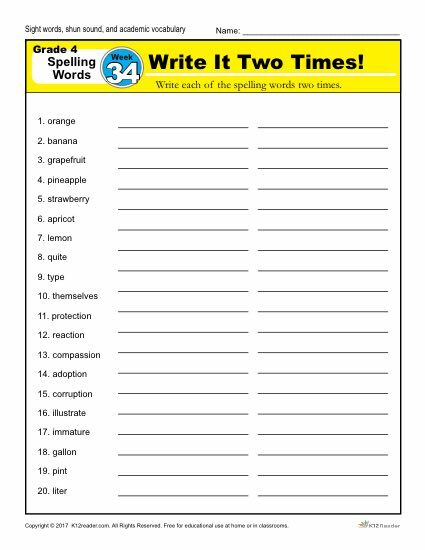 The 4th grade spelling words for week 34 is made up of 20 words that include sight words, shun sound, and academic vocabulary. There are 5 activities to help students master the words: Write it Two Times activity, Circle the Correct Spelling activity, Dictation Sentences (where the teacher/parent says the sentence and the student writes it), and two Write a Sentence activities. Spelling words include: orange, banana, grapefruit, pineapple, strawberry, apricot, lemon, quite, type, themselves, protection, reaction, compassion, adoption, corruption, illustrate, immature, gallon, pint, and liter. This week’s spelling list is part of our free 36 week 4th grade spelling program.